Editor's Note: This interview originally appeared in the February issue of DS News. 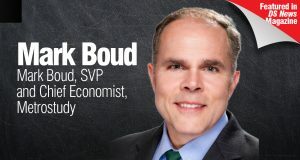 Mark Boud is SVP and Chief Economist at Metrostudy, a Hanley Wood company. Boud and a team of analysts closely follow the commercial and residential real estate markets throughout the United States. His modeled forecasts and analytics are trusted by major builders, land developers, and capital groups and financial institutions. He is a member of the Urban Land Institute, the Building Industry Association, the Sales and Marketing Council, the Southern California Real Estate Research Council, and the Northern California Real Estate Research Council. Boud is a graduate of Brigham Young University and holds a degree in Economics with a minor in English literature. Boud spoke to DS News about the trends in the housing markets, the affordability crisis, and the reasons he was drawn to economics. As an economist who primarily analyzes the commercial and residential real estate markets, how does this change your focus from that of a general economist? For housing, I focus on economic, socio-economic, and demographic factors that impact new home supply and demand. That mainly translates to permits, construction starts, job change by type and by magnitude, mortgage rates, household incomes, sales volume, and resale turnover rates, home equity wealth, tax laws/fee structures, and buyer segmentation/ psychographics. The model for nonresidential space changes based on the type of space. Retail and medical office demand follows local ‘rooftops’ or population growth. General office and industrial space demands are more dependent upon the type and magnitude of job growth. How can professionals apply the data you and your colleagues at Metrostudy are uncovering into real-world applications? Our builder clients employ our models to time the purchase of land or to negotiate a better land deal. They use our information to understand the market cycle and glean insight into conditions during the next five years. Lack of homes on the market has been cited as one factor of the affordability crisis—how do you see this trend continuing to play out in 2019? Pent up housing demand will continue to ‘wax’ through 2019, plateau by 2020, and begin to recede in and after 2021. It mainly follows our forecast for job growth or loss (and we’re forecasting a recession to begin late 2020 or early 2021). Despite enormous current and future levels of pent-up housing demand through 2021, overstated prices will slow absorption, causing much of this demand to remain unmet. When housing supply and demand are out of balance, (which they usually are), price (or more specifically, mortgage costs which incorporate rates), equalizes them. So, currently we have enormous levels of pent-up demand, but sales volume will probably continue to slow because of affordability (or lack thereof). What excites you most about your job as an economist? I love it. From my Freshman Econ 110 class, I was hooked and knew I wanted to apply it to real estate. Most ‘market’ studies focus on a comp-analysis, basically an appraisal—which is always a backward glance. I wanted to introduce a forward look in what I refer to as ‘feasibility’ studies. I love what I do. As a real estate economist, having access to all of Metrostudy’s data is sort of like living in a candy store.